4K resolution is widely predicted to be the main development trend of video resolution, which is on the way to all of us. While, High Efficiency Video Coding (HEVC/H.265) is the latest video compression standard that promises to deliver visual quality equivalent to H.264/AVC with up to 50% bitrate savings. In most cases, to get higher video quality, you may want to create H.265/HEVC video from your 4K Videos, but how? Actually, waves of H.265 encoders and decoders like MediaCoder, Handbrake, etc. are coming to the market. Which one to choose is the key? Well, Pavtube Video Converter Ultimate is considered to be best 4K to H.265 Video Converter. With it, you can effortlessly encode/re-encode Sony(XAVC/XAVC S), Blackmagic, GoPro(4K MP4), Panasonic 4K footage to H.265/HEVC MP4 for H.265 players as well as convert H.265 videos to any non-H.265 video format MP4, MOV, WMV, FLV, MPG, AVI, MKV… as you want. Thanks to the built-in video editor, you can trim, crop and retouch your videos in clicks. Overall, this program is a completely professional 4K video converter, player and editor. Download the program and learn in detail. STEP 1. Download, install and run top HEVC Converter; click “Add Videos” icon to load your source 4K files. STEP 2. Click “Format” bar and choose “Common Video > H.265 Video(*.mp4)”. 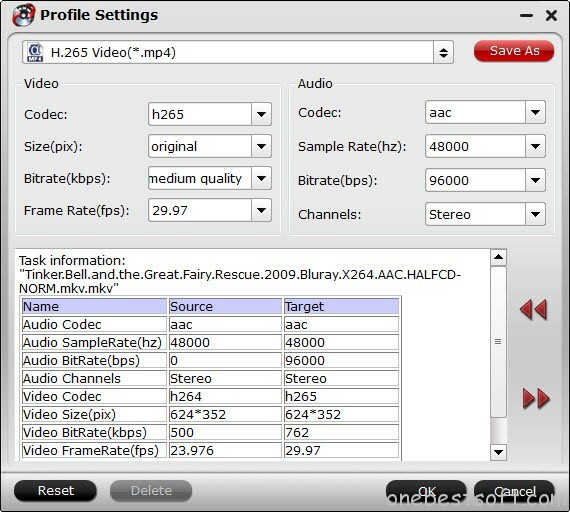 Since this video converter also provides optimal profiles for kinds of editing programs and media devices, you can also select a proper format that best meets your needs. STEP 3. If necessary, click “Settings” button if you’d like to customize advanced audio and video parameters like Video Codec, aspect ratio, bit rate, frame rate, Audio codec, sample rate, audio channels to get ideal quality. STEP 4. Hit the convert button; it will start converting 4K to H.265 MP4 instantly. Soon after the conversion, just click “Open” button to get the generated files. You will certainly be satisfied with its final video quality. After that, you can load the converted H.265 MP4 into Pavtube Video Converter Ultimate and preview it. Tests show that the H.265 playback is very smooth. What’s more, this upgraded Ultimate converter supports ripping Blu-ray and DVD to H.265 MP4! Just grab a free trial of the player to enjoy your H.265 goodies!